The TSH rat ELISA is an enzyme immunoassay for the quantitative measurement of TSH in rat serum. For research use only. Not for use in diagnostic procedures. Thyroid stimulating hormone (also known as thyrotropin or TSH) is a glycoprotein produced by the anterior pituitary gland. Through its action on the thyroid gland, it plays a major role in maintaining normal circulating levels of the iodothyronines, T4 and T3. The production and secretion of TSH is controlled on the one side by negative feedback from circulating T4 and T3, and on the other side by the hypothalamic thyrotropin-releasing hormone (TRH). The TSH molecule is composed of two non-identical subunits, a and §, that are bound together in a noncovalent manner. Within a species, the TSH a unit is structurally identical to the a subunits of related glycoprotein hormones (LH, FSH). The § subunits of the related hormones are structurally hormone-specific and therefore determine their unique biological activities. The mechanism controlling thyroid function in rats is exactly analogous to the mechanism operating in humans. This means that thyrotropin-releasing hormone stimulates the release of TSH from the pituitary gland as well as the serum concentrations of T4 and T3 influence the action of the pituitary gland. This similarity between rat and human thyroid physiology makes the rat a very useful model for evaluating the effects of new drugs on thyrometabolic status. The test kit is a solid phase enzyme immunometric assay (ELISA) in the microplate format, designed for the quantitative measurement of TSH in rat serum. The microplate is coated with a monoclonal antibody specific for TSH. Calibrators and samples are pipetted into the antibody coated microplate. Afterwards, a polyclonal horseradish peroxidase-labeled antibody is added. During a 18-20 hours incubation at 4 °C sandwich complexes consisting of the two antibodies and the rat TSH is formed. Non-reactive components are removed by a washing step. A chromogenic substrate, TMB (3,3',5,5'-Tetra-Methyl-Benzidine), is added to all wells. During a 30 minutes incubation, the substrate is converted to a colored end product (blue) by the fixed enzyme. Enzyme reaction is stopped by dispensing of hydrochloric acid as stop solution (change from blue to yellow). The color intensity is direct proportional to the concentration of rat TSH present in the sample. The optical density of the color solution is measured with a microplate reader at 450 nm. Bi-chromatic measurement with a 600 - 690 nm reference filter is recommended. Before starting the assay, read the instructions completely and carefully. Use the valid version of the package insert provided with the kit. Be sure that everything is understood. Do not mix reagents of different lots. Do not use expired reagents. The microplate contains snap-off strips. Unused wells must be stored at 2 — 8°C in the sealed foil pouch and used in the frame provided. Avoid contact with Stop Solution. It may cause skin irritation and burns. Pipetting of samples and reagents must be performed as quickly as possible and in the same sequence for each step.Change pipette tips between samples and reagents to avoid carry over contamination. Use reservoirs only for single reagents. This especially applies to the substrate reservoirs. Using a reservoir for dispensing a substrate solution that had previously been used for the conjugate solution may turn solution colored. Do not pour reagents back into vials as reagent contamination may occur. Mix the contents of the microplate wells thoroughly to ensure good test results. Do not reuse microwells. Do not let wells dry during assay; add reagents immediately after completing the rinsing steps. Assay reagents contain Thimerosal against microbial growth. In case of contact with eyes or skin, flush immediately with water. All reagents should be at room temperature (21-26°C) before use. Temperature will affect the absorbance readings of the assay. However, values for the patient samples will not be affected. Calibrated variable precision micropipettes (25 pt, 50 pt, 100 pt, 200 pt and 1000 pt). All reagents should be at room temperature before use. Dilute 50 ml of IOX concentrated Wash Solution with 450 ml deionized water to a final volume of 500 ml. The diluted Wash Solution is stable for at least 3 months at room temperature. When stored at 2°C to 8°C all reagents are stable until expiration date or 30 days after opening. The Stop Solution is stable up to 2 months after opening or until the expiration date. The Wash Solution is stable for 3 months after dilution or until the expiration date. Store Calibrators refrigerated, they will be stable at 2°C to 8°C for 7 days after reconstitution or until expiration date. For longer storage freeze at -20°C. Protect Divisible Microplate from moisture. Store together with desiccant and carefully sealed in the plastic bag. Protect TMB-Substrate Solution from light. For determination of rat TSH serum is the preferred sample matrix. The procedure calls for 25 pl matrix per well. The samples may be stored refrigerated at 2 — 8 °C for one week, or up to 2 months frozen at —20 °C. To avoid repeated thawing and freezing the samples should be aliquoted. Samples expected to contain rat TSH concentrations higher than the highest calibrator (80 ng/ml) should be diluted with the Diluent before assay. The additional dilution step has to be taken into account for the calculations of they results. All reagents and specimens must be allowed to come to room temperature before use. All reagents must be mixed without foaming. Once the test has been started, all steps should be completed without interruption. Use new disposal plastic pipette tips for each standard and sample in order to avoid cross contamination. Absorbance is a function of the incubation time and temperature. Before starting the assay, it is recommended that all reagents are ready, caps removed, all needed wells secured in holder, etc. This will ensure equal elapsed time for each pipetting step without interruption. As a general rule the enzymatic reaction is linearly proportional to time and temperature. For internal quality control we suggest to use Rat Control Set available from the manufacturer. Each run must include a standard curve. Prepare a sufficient number of microplate wells to accommodate calibrators and samples in duplicates. 3. Pipet 25 pI of each calibrator, control and sample into the wells prepared. 4. Add 200 pl of Enzyme-Labeled Anti-Rat TSH antibody to all wells. 5. Incubate for 18-20 hours at 4•C. 6. Discard the content of the wells and wash 4 times with 300 pI buffered wash solution. Remove as much wash solution as possible by beating the microplate carefully. 7. Add 200 pI of TMB/Substrate Solution to all wells. 8. Incubate for 30 minutes in the dark. 9. Add 50 pI of Stop Solution to each well and mix carefully. 10. Read the optical density at 450 nm. Bi-chromatic measurement with a reference at 600. 690 nm is recommended. The developed color is stable for at least 15 minutes Read optical densities during this time. Calculate the average absorbance values for each set of calibrators, controls and patient samples. Using semi logarithmic graph paper, construct a standard curve by plotting the mean absorbance obtained from each standard against its concentration with absorbance value on the vertical (Y) axis and concentration on the horizontal (X) axis. Using the mean absorbance value for each sample, determine the corresponding concentration from the calibration curve. Automated method: Computer programs using cubic spline, 4 PL (4 Parameter Logistics) or Logit-Log are recommended. The concentration of the samples can be determined directly from this calibrator curve. Samples with concentrations higher than that of the highest calibrator have to be further diluted. For the calculation of the concentrations, this dilution factor has to be taken into account. Following data are intended for illustration only and should not be used to calculate results from another run. In order to determine the normal range of serum TSH in rat, samples of male and female rats were collected and analyzed using the TSH rat ELISA kit. The following ranges are calculated with the results of this study. It is recommended that each laboratory establish its own normal range since TSH levels can vary due to handling and sampling techniques. The lowest analytical detectable level of TSH that can be distinguished from the Zero Calibrator is 0.1 ng/ml at the 2SD confidence limit. The following materials have been evaluated for cross reactivity at 10 ng/ml. The percentage indicates cross reactivity at 50% displacement compared to TSH. The intra-assay variation was determined by 20 replicate measurements of 6 serum samples within one run. The inter-assay (between-run) variation of 3 serum samples was determined in 9 different assays. Using the Calibrator Matrix three spiking solutions were prepared (A = 560 ng/ml, B = 280 ng/ml and C = 140 ng/ml). A 50 pt aliquot of each solution was spiked into 950 pt of three different sera, for a spiking ratio of 1 to 19, leaving the serum matrix of the spiked samples relatively intact. All samples were then measured by rat TSH procedure. To calculate expected values 95% of the unspiked values were added to 5'/o of the spiking solutionconcentrations. Three serum samples were assayed undiluted and diluted with the calibrator matrix. 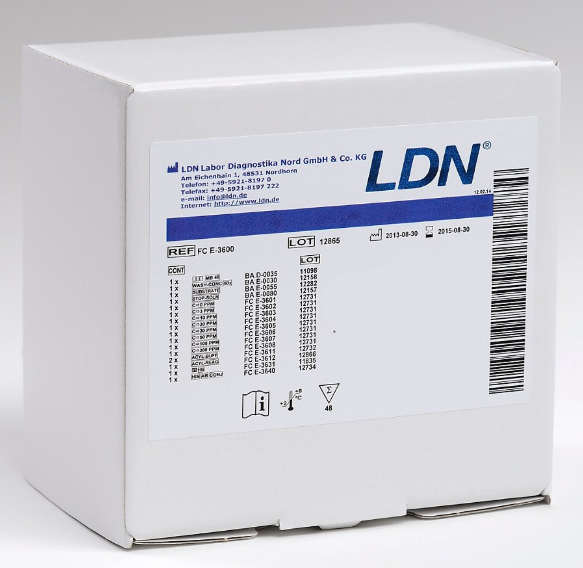 Reliable and reproducible results will be obtained when the assay procedure is performed with a complete understanding of the package insert instruction and with adherence to good laboratory practice. Any improper handling of samples or modification of this test might influence the results. Until now no substances (drugs) are known influencing the measurement of rat or mouse TSH in serum. Lipemic and haemolysed samples can cause false results.